Introduction: The anatomy of the human temporal bone is considered to be among the most complex structures in the body. Critical nervous, vascular and other structures are closely related to each other, often by only a few millimeters. Long training periods, exhaustive temporal bone dissection and surgical observation have traditionally formed the basis for education. Residents, at some stage during their education, have some difficulties in understanding the anatomy when shown only through theoretical bidimensional anatomy lectures. 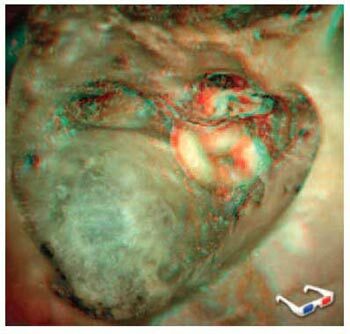 Tridimensional stereoscopic images may allow a better understanding of the important relationships among the structures within the temporal bone. Objectives: The objectives of this study were: 1) to demonstrate stereoscopic tridimensional images of the human temporal bone; 2) to demonstrate how to acquire and generate these tridimensional images with simple pieces of equipment such as digital photographic camera and freeware software, discussing the technical difficulties in the acquisition and edition of these images. Method: Fourteen temporal bones were dissected in the Anatomical Laboratory of Professor Edmundo Vasconcelos Hospital, São Paulo-Brazil. Four were selected in order to obtain photographic examples of surgical landmarks. Results: We created good quality stereoscopic tridimensional images of the anatomy of the human temporal bone. Conclusions: The tridimensional stereoscopic images were acquired with low cost equipment, without great difficulty and its use can improve the anatomical knowledge of ENT residents in otologic surgery. We live in a physically tri-dimensional world, but our teaching and documentation techniques are essentially based on the use of oral and written language in bi-dimensional reproductions(1). The complexity and richness of tri-dimensional details of the surgical anatomy of the human temporal bone makes otologists need to know it deeply before starting his/her surgical practice(1,2). Nervous, vascular and other structures are closely related, sometimes separated just by a few millimeters. The inter-related microscopic structures, the several plans and deepness make the ear anatomic teaching difficult to understand, mainly when classically demonstrated in anatomy books or bi-dimensional theoretical classes(3,4,5,6,7,8). The understanding of complex physiology and anatomy mechanisms, such as sound transport, intra-temporal route of the facial nerve and the structures of optical capsule (vestibule, semi-rounded canals, cochlea and its recesses) is an important part for safe ontological surgeries. Long training periods are usually necessary through dissections of temporal bones to educate otorrhinolaryngologists and such process has been currently harmed once obtaining anatomic pieces at Serviços de Verificação de Óbito (SVO) has becoming more and more difficult in Brazil. Meanwhile, computer programs simulating virtual dissections have been created in several countries, where it is even more difficult to obtain anatomic pieces to educate medical resident doctors. Training doctors usually have some difficulty to understand anatomic structures presented in books, dissection manuals and in classes, which are most of the times presented with bi-dimensional structures. The tri-dimensional stereoscopic images, once they provide deepness perception, may allow a better knowledge and understanding of the important relations between the structures of the temporal bone(3,4,7,8). Traditionally, tri-dimensional stereoscopic images, that is, the ones which contain clear deepness perception, may be obtained through three basic methods: parallel, polarized or anaglyphic. Each method has its peculiarities, advantages and disadvantages, but all of them basically need special equipment to capture and project/demonstrate: such as proper cameras, specific supports, glasses, projectors or special screens. Such equipment is frequently unavailable to most Brazilian institutions due to the high financial cost, being also equipment which is difficult to maintain and manage(8). The objectives of this project are: 1) to show tri-dimensional stereoscopic images of the temporal bone; 2) to demonstrate how to obtain and generate such tri-dimensional images with simple equipment such as digital camera and proper free computer program, discussing the technical difficulties found to acquire and edit such images. Among the 14 temporal bones kept in formol and dissected under supervision in the anatomy laboratory of Hospital Professor Edmundo Vasconcelos, in São Paulo, four were selected by doctors who were certifiably experienced in otologic surgery to obtain images of anatomic marks of temporal bone. 1) Functional and anatomical importance. 2) Sequence usually found in Mastoidectomies up to the antrum of the mastoid portion of the temporal bone. Two different pictures of the same image were captured for stereoscopic formation moving the camera in horizontal plan, without specific support. A distance varying from 62 up to 66 mm was used. The camera was directly connected to the microscope ocular to acquire the images (DF Vasconcelos). Such adaptation did not need devices, supports or special instruments. The pictures were edited with the computer program: Adobe Photoshop 8.0 version. After the edition, the images obtained were used to make tri-dimensional stereoscopic images (anaglyphic) in proper computer program Callipygian 3D 2.9 version, which may be found free of charge on Internet at the following electronic address: http://www.callipygian.com/3D. We used basic equipment of anatomic dissection of the temporal bone (Picture 1). We obtained high-quality bi-dimensional digital images containing 6-megapixel resolution. After editing and using proper computer program, we created excellent tri-dimensional stereoscopic images (Pictures 2,3,4,5,6,7,8). Picture 1. Stereoscopic image of basic material used for anatomic dissection. Picture 2. Surface anatomy: temporal bone prepared for dissection. anatomic points: zygomatic arch, mastoid point, external auditory channel. 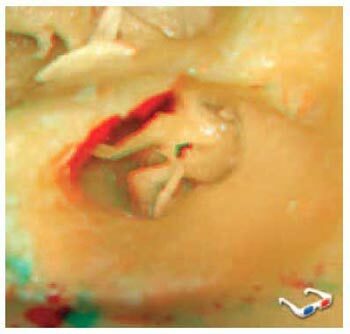 Picture 3. cortical mastoidectomy: mastoid cortex. Mastoid point, external auditory channel. Picture 4. sub-cortical mastoidectomy: cross-channel view. ossicles: mallus, incus and stapes. eardrum cord nerve. 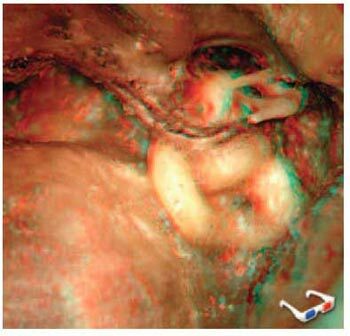 Picture 5. closed cavity mastoidectomy: incus short branch, lateral semi-rounded channel, medium fossa dura mater, sigmoid sinus, external auditory channel. Picture 6. closed cavity mastoidectomy: posterior tympanotomy. incus short branch, pyramidal eminence, rounded window, medium fossa dura mater, sigmoid sinus, external auditory channel. 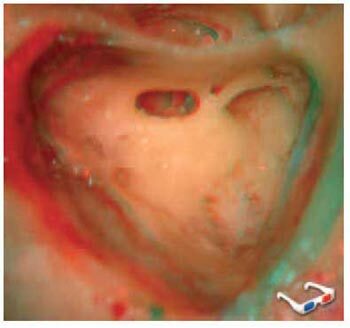 Picture 7. cross-labyrinth access: semi-rounded channels, facial nerve, incus, mallus, stapes, rounded window, sigmoid sinus, medium fossa dura-mater. Picture 8. cross-labyrinth access: semi-rounded channels, facial nerve, incus, mallus, stapes, rounded window, sigmoid sinus, medium fossa dura-mater. The pictures require specific glasses which may be found in sale, made at low cost. The stereoscopic reproduction methods have already been described in the mid 19th century(9). Since the second half of last century, several stereoscopic reproduction techniques have been developed for projection and printing. However, the advance of digital cameras and computer programs for the last years has strongly facilitated and optimized the performance and spread of tri-dimensional stereoscopic images. In our area, the use of tri-dimensional stereoscopic images, which enable a real deepness perception, may be extremely useful for a better demonstration of anatomic structures in their several levels of macro- and microscopic observation, thus providing an important teaching and documentation tool. Although tri-dimensional anatomic images were already done some decades ago, its use has been poorly disclosed, probably due to difficulties in manufacturing, reproduction and cost(5,6,7,8). Basically, there are three methods to generate tri-dimensional stereoscopic images: anaglyphic, parallel and polarized. Each method represents advantages and disadvantages. Among others, the most simple and known one is the anaglyphic method(1), which consists of overlapping two slightly different images of the same structure coloring each one of them with a basic color. Such images are interposed and visualized in stereoscopic way, with the use of glasses made of filters of the same colors, which makes each eye able to visualize only the image stained with the color of the respective filter. The most used filters are red and blue(1,2). The final anaglyphic image may be produced either in gray scale, or in colors, but with a discreet setback of basic color visualization, specially red. In this method which was used by us, we observe that the images may be captured with evident background for a better visualization of structure deepness(1). With a simple digital camera and free computer program, we obtain tri-dimensional stereoscopic images of the human temporal bone with high quality. 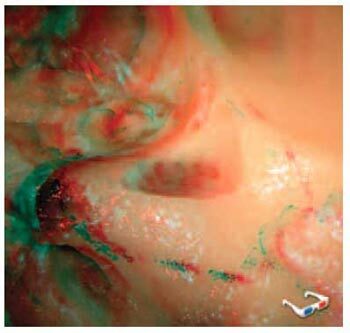 Such images were obtained with low cost and slight technical difficulties and its use may improve the anatomic knowledge of resident medical doctors in otologic surgeries. 1. Ribas GC, Bento RF, Rodrigues Jr AJ. Reproduções impressas de imagens tridimensionais estereoscópicas para ensino, demonstrações e documentações. Arq Int Otorrinolaringol. 2000, 4(2):48-54. 2. Bento, RF; Ribas, GC; Sanchez, TG; et al. Demosntração Tridimensional da Anatomia Cirúrgica do Osso Temporal. Arq Int Otorrinolaringol. 2000, 4(2):43-47. 3. Trelease RB. Toward Virtual Anatomy: A Stereoscopic 3D Interactive Multimedia Computer Program for Cranial Osteology. Clin Anat. 1996, 9:269-272. 4.Trelease RB. The Virtual Anatomy Practical: A Stereoscopic 3D Interative Multimedia Computer Examination Program. Clin Anat. 1998, 11:89-94. 5. Bassett DL. A Stereoscopic Atlas of Human Anatomy. Portland: Sawyer's Inc., 1961; 6. Chase RA. A Stereoscopic Atlas of Human Anatomy, The Bassett and Gruber Legacy, 3D Book Productions, Borger, 1994. 7. Kraus GE, Bailey GJ. 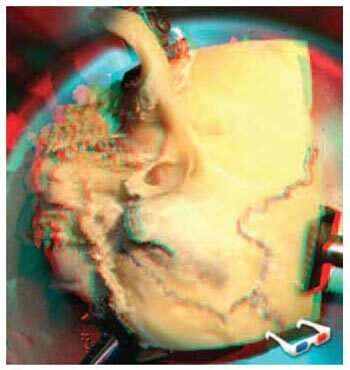 Microsurgical Anatomy of the Brain: A Stereo Atlas. Baltimore: Williams and Wilkins, 1994; 8. Poletti CE, Ojemann RG. 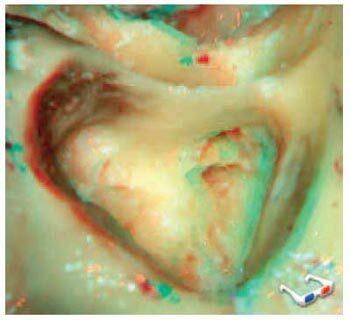 Stereo Atlas of Operative Microneurosurgery. St. Louis: CU Mosby Co., 1985. 1. Medical resident doctor on Otorrhinolaryngology Hospital Professor Edmundo Vasconcelos. 2. Fellow - Otologic and Skull Base Surgery - Universidade de São Paulo. Otorrhinolaryngologist. 3. Otorrhinolaryngologist, Hospital Professor Edmundo Vasconcelos. 4. Medical resident doctor on Otorrhinolaryngology by UNIFESP/EPM. 5. Medical resident doctor on Otorrhinolaryngology. 6. Doctor's degree. Chief of São Paulo Otorrhinolaryngology Center. This study was presented and awarded with the "President's Award" at 2007 American Academy of Otolaryngology, Head and Neck Surgery Annual Meeting, performed in September 2007, in Washington, DC, United States. This article was submitted at SGP (Publication Management System) of R@IO on March 23, 2008 and approved on March 24, 2008, 16:18:04.